When I was a kid I went on a field trip to the circus. One of the things that impressed me the most was the guy that juggled. As he switched from object to object I found myself in awe! I swear that guy could juggle three kitchen sinks if he wanted to. One of the things I’m learning about life is in order to be healthy and happy I have to have balance. Balance is necessary in every facet of my life. When it comes to building a new house, coaching sports, attempting to be healthier, spectating sports, time with my wife, work, time with friends, and personal time(by personal time I mean emotionally, spiritually, physically, mentally, and rest); I have to find a balance. If I focus too much on one aspect then the rest of the areas get ignored. When parts of my life get ignored then the other areas suffer. Finding balance is key. For example, I went to the doctor recently and have committed to getting healthier. I discovered that I have a pattern with dieting and eating. I commit to eating healthy and that lasts for about 2 weeks. Then, I slip into bad eating habits again for about 2 months or more. Then, I realize the error of my ways so I commit to eating healthy again. And so the pattern goes. If somehow I could flip-flop that pattern I might make a lot better progress. 🙂 Being more aware and more deliberate about my eating habits helps give me balance throughout all areas of my life. I was looking at inspirational pictures online when I came across the one above and thought it was a great reminder of giving ourselves a break. Up until last Wednesday, I was feeling pretty good about the progress I was making in regards to my health. The days after Wednesday weren’t the healthiest of days so I felt those “Here you go again, you’re such a failure” thoughts creeping back in. You know the thoughts. “You might as well just give up trying seems how you know you won’t be successful.” And then I came across this quote. 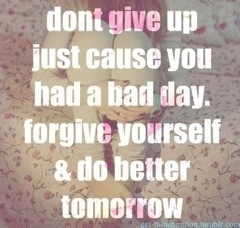 “Forgive yourself and do better tomorrow!” What words of wisdom! What are you struggling with? Are you focusing so much of your energy on one aspect of your life that the others are suffering? What can you do to find balance this week? What areas of your life do you need to just forgive yourself and do better tomorrow? Wishing you a balanced tomorrow!